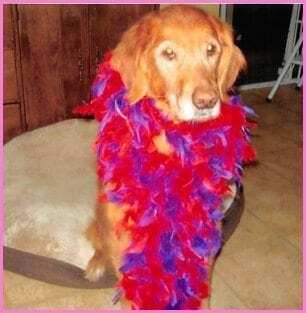 Gracie #4916 - Yankee Golden Retriever Rescue, Inc.
Gracie was 9 when her family could not keep her. Her owner was suffering from health problems and there had also been a death in the family. Gracie suffered from severe skin problems herself, and her family was convinced that no one would be willing to take her. They brought her to their vet and asked that she be euthanized Their vet asked them to sign her over to the vet hospital, instead, and then called YGRR. Gracie was picked up by dedicated YGRR volunteers and transferred to our vet hospital. She had a complete senior exam and treatment was started for her ongoing skin and ear infections. She had several masses removed, as well, and they all turned out to be benign. Gracie was soon on her way to Riverview to recuperate and settle in. Gracie was a very loving and mostly laid back girl. She did love tennis balls, however, and acted like a much younger dog when playing! Her infections were quite severe and it took a long course of antibiotics to finally give her relief from her itchiness. A change in diet helped, as well. Gracie was very well-behaved with other dogs, but she mostly loved the attention of people. One of her cutest habits was sleeping on her back with all four feet in the air! Gracie had to stay at Riverview for months before we were confident her infections were under control. 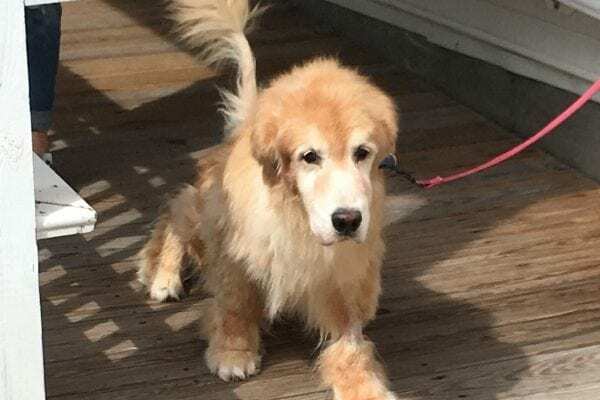 We knew she would need a dedicated adopter who would be willing to keep a close watch on her health and give her immediate treatment at the first sign of recurrence. Luckily, a repeat adopter was waiting for just the right dog to share her home with. Gracie was the perfect fit! Once she heard Gracie’s story, she couldn’t wait to give Gracie the care she needed for the rest of her life. Gracie bonded immediately with her owner, who includes her in everything. Gracie is even an honorary member of the Red Hat Society! Her adopter says that Gracie is her special girl –she is beautiful and sweet and the love of her life! Gracie feels the same way and is never far from her owner’s side. She still loves to sleep with her four feet up in the air! These lucky ladies could not be happier to have each other! Gracie thanks you for your support. Gracie was itchy and uncomfortable when she arrived at our veterinarian. She also had complications that slowed the healing of her incisions. Gracie didn’t have to worry, however, because your donations allowed us to meet all her needs. She was welcome to stay as long as necessary and received only the best medical attention with YGRR. She was also showered with TLC by staff and volunteers. Without your support, Gracie may not have had her second chance at life. Thank you from the bottom of our hearts for being there for dogs like Gracie. Gracie and all the Rescue Goldens send big wags and kisses your way, and wish you Happy Holidays!